It’s is Project Recycle & Create time and today we are reusing plastic bags! Although I *try* to remember to take shopping bags with me when I go to the shop, I sometimes forget so we do end up with plastic bags. 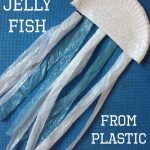 Some I send to school(they use it too) and some I recycle like we did with this cute jelly fish and fun cheering pompoms. Today I’m showing you how to make a doormat! I wish I had different colour plastic bags, think it would look nicer. This doormat is used at our backdoor for muddy feet. Something I won’t mind getting dirty, lol! I used a piece of chicken wire and about 5 bags. (Just make sure all the sharp edges of the wire are cut or turned downwards.) The bags were cut into strips, leaving out the handles. After the chicken wire was filled, I turned it around and weaved some strips over again to help keep it in its place. The ends were knotted. And that is it! Rather easy and great for reusing some plastic bags! My 7 year old nephew said it was cool, so I suppose he liked it? Come see what Peakle Pie and The Gingerbread House made with their plastic bags! tanya recently posted…What Matters Most? Experience or Studies? This is such a great idea, I love recycling which is practical too! Nice Concept on preparing door mate. Nice idea. thank you.